More info:Plus add 146 Euros conservation fee. A stunning 7 day Seychelles sailing cruise around Praslin and La Digue islands as well as some of the smaller highly protected beautiful island idylls, supporting conservation organisations en route. The Seychelles have the most unique ecosystems in the world, with ancient geological and natural features that stretch back to the time when this archipelago, actually a submerged mountain range, broke away from the famous Gondwana supercontinent millennia ago. The Seychelles are also famous for their blissful beaches, of course, as well as an impressive ongoing commitment to conservation. Many of the islands that we anchor by and visit are run by non profit making organisations or conservation foundations, charging a visitor’s fee which goes towards preserving these very special ecosystems and habitats. The largest islands we visit are Praslin and La Digue. 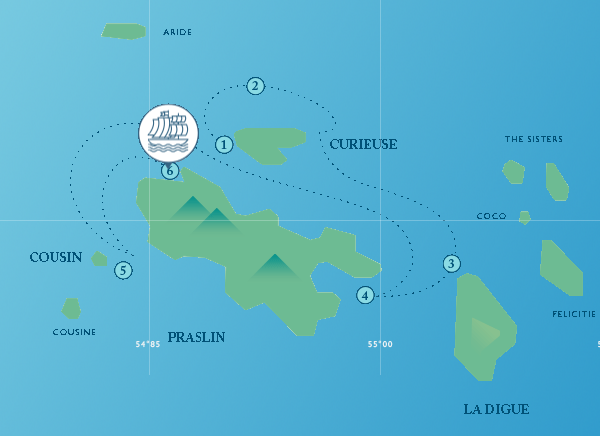 The former is home to the UNESCO World Heritage Site, Vallée de Mai, where the famous double sea coconut grows. It is also a popular spot for snorkelling and scuba diving, both of which we can facilitate on this sailing cruise, with PADI courses an additional option. The latter, a beach rich beauty, is a tranquil island where everyone gets around by bike and where the Anse Source D'Argent coast, with its granite boulder natural sculptures, is sometimes considered one of the planet’s most photogenic beaches. We also visit some of the tiny satellite islets, such as Curieuse, where we can explore mangrove forests, a sea turtle farm and the ruins of a former leper colony, making for quite a magical mix on such a small, virtually uninhabited island. Or Cousin Island, where a nature reserve and Important Bird Area now preserve the all important habitats for colonies of sea birds and rare endemics, such as the Seychelles sunbird, Seychelles blue pigeon and the Malagasy turtle dove. As well as these unique and diverse island landscapes, the Seychelles also have diverse cultures and varying island histories, making every day different on this holiday. You will have plenty of time to wander and explore both on land and underwater as we sail through every blue in the palette. All meals are provided on this trip, with ingredients sourced locally. The smaller size of our ship and the smaller passenger numbers ensures that any detrimental social and environmental impacts are minimised whilst allowing the passengers to visit smaller communities that don’t usually benefit from this form of tourism. Most tourists to Seychelles stay (and often don’t leave) some large resorts in a few restricted locations, so by enabling our passengers to visit some different areas without putting any strain on local amenities, we are spreading the financial benefits and the load of our visit. Seychelles National Parks Authority - a government agency charged with the protection of all national parks, including the variety of marine park reserves we visit on our itinerary such as the Cousin Island Nature Reserve & Vallee de Mai Nature Reserve. Marine Conservation Society of Seychelles - an NGO with a particular focus on marine research, which has spearheaded a variety of initiatives toward the better understanding and conservation of sea turtles, sharks, whale sharks and marine mammals. Nature Seychelles - an NGO which is responsible for the management of Cousin Island Special Reserve. We will visit Cousin Island, a bird sanctuary run by Nature Seychelles and their partner, Birdlife International. Our visit, apart from educating our guests to the fantastic work being done on the Seychelles, provides a little funding to the NGOs that are working to preserve some of the world's rarest species. In 1959 there were fewer than 30 Seychelles warbler left alive, all on Cousin Island. Following fantastic work by these NGOs and others, the population began to recover and birds were translocated to other islands. The island also hosts the incredibly rare Seychelles fody, Seychelles magpie-robin, the endemic Seychelles sunbird and Seychelles blue pigeon as well as the Malagasy turtle dove. The island hosts over 300,000 nesting seabirds of seven species. All the food on board is bought in the Seychelles; fruit, vegetables, plenty of fish, meat and other staples are all locally grown and produced, and much of it is bought from small retailers or even directly from the grower or fisherman. We rely heavily on small local businesses for providing local excursions for our passengers, providing an income to several smaller local firms. The ship’s managers will buy as much of their produce as possible from local communities, and we will also encourage our passengers to spend money in the communities that we visit. By trying some local fruit juice instead of a well known American brand of soft drink, you will support the economy, it will be better for you and, who knows, you might find you enjoy it more too. We will encourage our passengers to learn and understand as much as possible about the local traditions and way of life to enable them to appreciate the reality of life in the Seychelles. The ships managers state that they "are committed to build upon this experience and success and provide high standards of service, while operating in a responsible and sustainable manner in co-existence with the natural eco-systems we visit." Snorkling in the seychelles in very deep water with divers below us. The holiday was very good although being stranded at the airport after a very long flight was very disappointing even though we had already paid for the transfers and i had sent an email double checking the transport was arranged just before i left. When we were leaving the seychelles the transport was late and we had to call to find out what was happening. They sent someone to collect us in a very small car with a child in it!! They said that the other taxi was on its way??? Half way through this the other taxi did come and we had to swap cars midway this driver also had his wife and child with him. Being in a different location every day enabled us to see so many beautiful, breathe taking places. Do not hesitate, book up!! The food was excellent the cabins were comfortable the staff were lovely, nothing was too much bother. The children on board were not bored, as card games books, etc. available when on the boat. Perfect!